I think it's one of my favorite baby quilts ever... 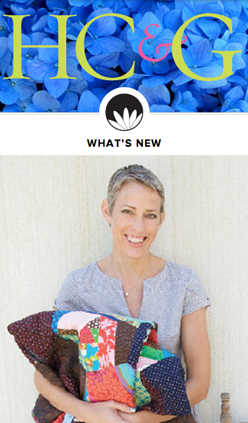 It is scrappy, includes funky, modern, solids and prints, and has a nod to traditional quilts, right up my alley! 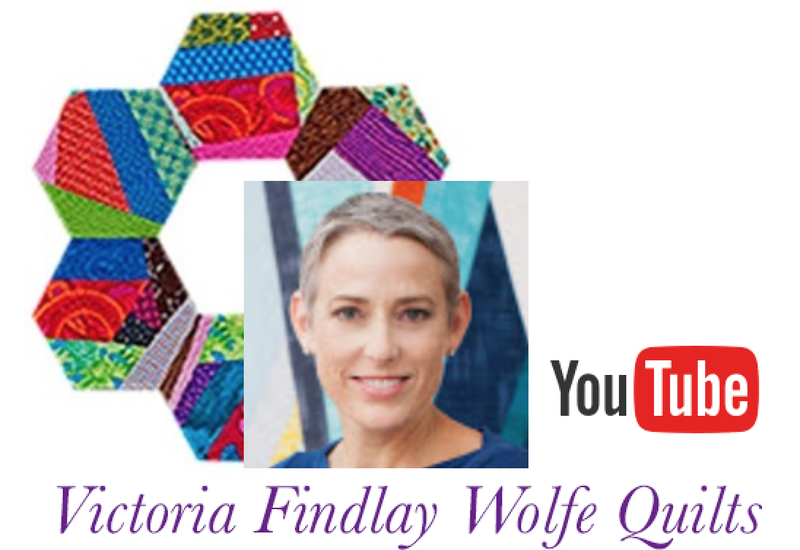 (See the family photo down below, I'm wearing the colors that match this quilt, so you can see it's very ME!) If I had another wee baby girl, she'd be wrapped up in this and snuggled, no doubt! 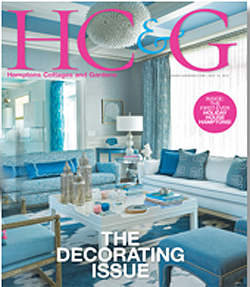 There are a lot of great stories in the magazine this issue! Would you like to win a copy for yourself to see? Telling me a highlight of your summer. I will leave it open until Friday of this week 10am EST. My goodness, you're more colorful than the rest of the family, aren't you?! I'd love to win this copy. Not available anywhere around here that I've seen. Summer highlight...my 93 year old mother had a masectomy and is already acting and feeling like it never happened. Feeling so blessed about that! Thanks for the giveaway. Summer highlight was pedaling around Block Island for a day with my hubs! Your quilt is grand, and your outfit matches! I would love to win a copy. Best summer ever spending time with my 3 grandchildren and finding out another one is on the way. Life is great. 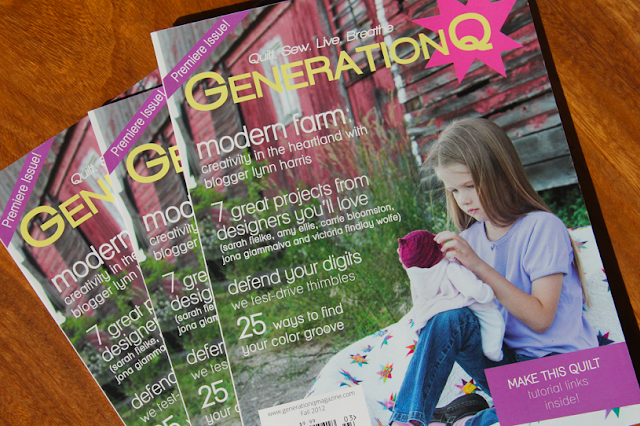 Love your quilt and I would love to win the magazine. btw, your outfit is smashing!! My highlight was spending days with my hubby (about one per week) on day trips to fabulous little areas of northern Michigan - right in our backyard but oh so fine!! Congrats Ms.V...that is just the CUTEST baby quilt ever....will HAVE to get my hands on that magazine one way or another as there are a few more baby quilts on my 'to do list' (and now I won't sleep til I can make this one...ok, maybe a few naps). Highlight of the summer...having my gall bladder out and feeling like a human again! Love the pattern thanks for the chance to win a copy,. Highlight of our summer--Road Trip: picking cherries and swimming in Flathead Lake, MT, attending a family wedding in Cascade, ID, and hiking along the beaches and highlands of Big Sur,CA, with our daughter. Love that new baby quilt! I'm having my highlight right now! Visiting my grand kids in LA. Doesn't happen often enough! My summer highlight was learning how to English paper piece. 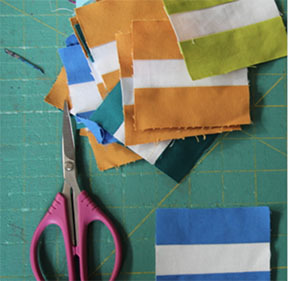 I love it, and it's becoming my favorite way of doing patchwork. Yep, takes forever, but it's so portable and relaxing. Now to figure out how to make it more modern. Maybe with the right fabric? It's still summer here in the PNW. We are newbies in this part of the country, so exploring new places has been our highlight. This part of the country is pure heaven on earth! The water, mountains, canyons, farmland, orchards, rivers, animals... I love it all! Your family is wonderful. 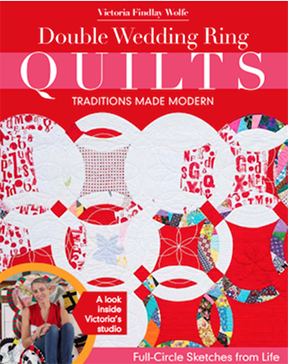 The quilt is fabulous and I would LOVE to win a copy of the new mag. My summer highlight was a trip to Arizona with my Modern Quilt Guild sisters for a three day retreat. We sewed, ate and gabbed! No greater fun than that! The highlight of my summer has been moving and beginning to set up my new quilt room! Thanks! FABULOUS Quilt! The colors are great! AND I love the family pix! You guys are look tanned and rested. The highlight of my summer was a family reunion at Cannon Beach...We don't look as put together as you guys...we are more sandblasted with windbreakers on! I would love to win since I have no clue WHERE to get this magazine! It's a fantastic little quilt V! Highlight of,the summer has been a successful Festival of Quilts and now 2 weeks break from work! :). I love that part of Canada! we travelled to NB and parts east nine years ago in our VW van, putting on 9,000 plus km. This summer we camped in the Rockies at Waterton Lakes National Park, just north of the Canada-US border. I was quilting in the campground, in the shadow of the rockies, finishing up my Dresden plate quilt, which has many fabrics from you. Great baby quilt, congrats on the article, and please pick me! One of the highlights of my summer was getting to spend a week at my cabin in the mountains. I'd love to see Baby Bubblicious in print. Thanks for sharing. LOVE tat quilt and this 60 year old would love nesting in it ! Summer highlight was kayaking around Omey Island (off Ireland!) with my sons! Love your quilt - and I just found out of a dear friend's granddaughter on the way soon! :) Summer highlights? trip to Ohio for a wedding, reconnected with a college friend, attended some beautiful concerts, days at the beach - a great summer! The highlight of my summer--and the whole year--has been the East Coast Trip with my daughter and my mom. We hit all the historical sites we could, plus a trip into NYC to the American Girl Doll store. 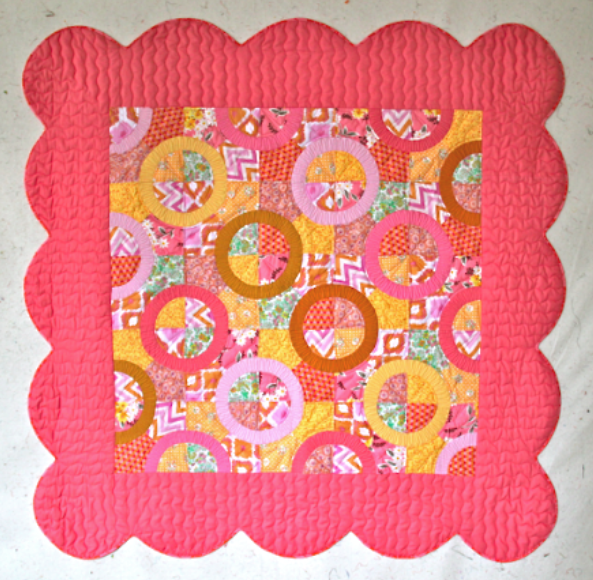 I sure like your baby quilt...can't quite figure out why the circles look like they've been shirred. First of all, LOVE your pink shirt! Second of all....what a great summer....I got my motorcycle licence and went riding around with my MOM! in upstate NY. Also made it to Niagra Falls, which I had never been to! Highlights of my summer so far were a trip to the Natural History Museum in NYC with my 3 year old grandson and playing with his little brother, finding out that another daughter is pregnant AND the engagement of my 3rd daughter. I'm feeling very grateful! About to spend a week in Acadia Natl. Park which will also be on the highlights list. 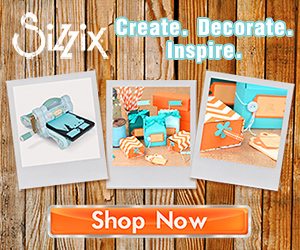 Love your blog. Please, please, did I say please...let me have one of these magazines. I can't find it anywhere and I soooooooooooo want one! ohhhhh, and the highlight of my summer was getting a crate for the dog so I could leave the house without fear of coming back to complete destruction. poor thing has such separation anxiety but luckily for me she just loves her crate. 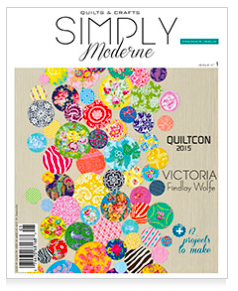 Love the baby quilt and I would really be happy if I won a copy of the magazine! The highlight of my summer? Just enjoying life. This summer I went on an Alaskan cruise with my 90 year old mother in law and my two sisters in law. What a wonderful vacation! We had perfect weather too. It certainly was a highlight. Highlight of my summer? Moving to Hawaii for a year or so - so lucky to be able to have this adventure!! Gorgeous quilt, would love to make it! The best part of my summer comes in two weeks. Our daughter from San Francisco is moving back east. Only 3 hours away rather than 2000 miles. Love your cute quilt! Highlight of my summer was finding two friends to form a sewing group. We get together twice a month to chat and eat treats and do handwork: my kind of fun! It sure has been a very busy summer.... the highlight for me was celebrating my granddaughters 4th birthday with her :0. Congratulations on your latest magazine publication! The quilt looks adorable I'd love to win a copy of the magazine to make my own. Wow! You are the most colorful of the lot! My summer highlight was doing daily water aerobics with old friends...with the sun shining down on us. The best moment this summer was when Allie and I saw My Vrazy Dream at the International Quilt Study Center! Adorable quilt. LOVE your neon shirt and orange sweater. :o) The highlight of my Summer so far is riding an antique carousel. It was like being a kid again. Thank you for the giveaway. Summer highlight so far: a few days at the beach of Lake Michigan. And more to coming in early September: skating in Montreal - I can't wait! Beautiful baby quilt and you sure bring color into the family picture. Thanks for a chance! Each and every day that I got to spend with my little moppet granddaughter. Watching her play in the ocean was a real treat. Whoa! I want that magazine! the highlight of my summer is definitely getting the tension worked out on my mid arm and getting 8 UFOs quilted! Hi Victoria!! The highlight of my summer was playing with my 2 yr grandaughter Jayden on the California Delta...we had so much fun!! Yummy quilt, I want bubble gum or sherbet. Great family photo. Loved visiting the beach and eating on the Santa Cruz Pier. I've had a good summer all in all, but the highlight would be the five day boating trip on the local lake system. The weather was beautiful and it was relaxing and soul restoring. Love that quilt! And I'd love to win the magazine with the pattern. We planned a big trip, but it was cut short by a family emergency so...the highlight of my summer was my daughter's good news: a new dream job in New York city. She's thrilled so we're thrilled for her. hen your kids are happy, you're happy. I love this cute quilt. Would love to win the magazine. 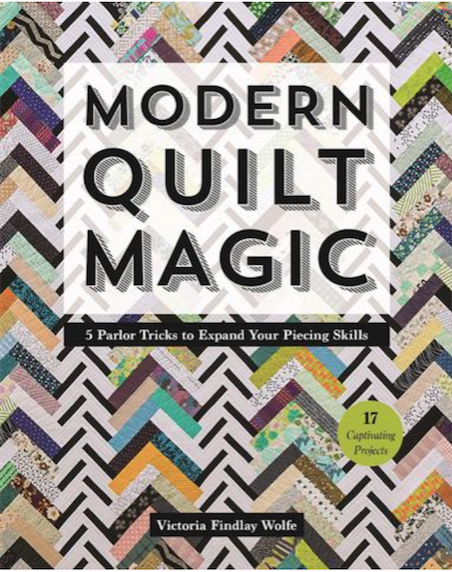 love this quilt V. so much energy and lots of VA VA VOOM! everyday was a highlight this summer, everyday with my kids. we learned so much this summer together. Hard to pick but visiting grandma was a kick. She was very up for a visit and my daughter loves the swim hole not far from her house. I love all the colors! They are exactly my colors, haha. My highlight has been being able to spend time with my nephews. At 2 and 6 they are a handful but so much fun. So wonderful!! highlight of my summer was sewing with my granddaughter. She made her first quilt :). I love the color combos you pick! The highlight of my summer was starting my much anticipated Emergency Medical Responder course!!! 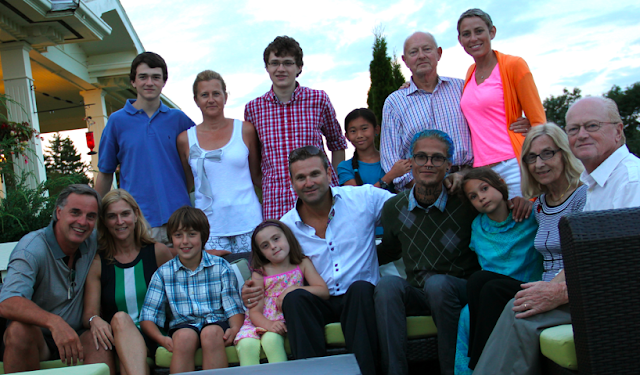 The highlight of our summer was when my daughter and her family came back across the ocean to live near us again. Thanks, Victoria! I'm about to start the highlight of my summer. Two weeks vacation with my girls and hubs! As soon as I saw this cute baby quilt, I was thinking 'Ooo, I have to make this too'. Will have to win one copy as I don't think I can buy it in New Zealand. BTW, love the colours of your outfit...orange is one of my favourites. My favorite thing this summer was having the entire family on vacation with us. That hasn't happened in years! 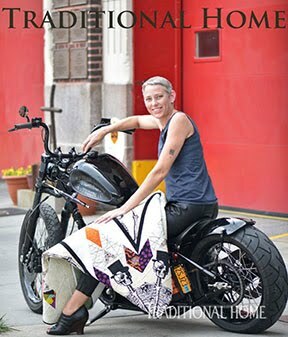 That quilt is delicious and the new magazine looks very cool & interesting, I'd love to win it! Highlight of the summer so far: got to watch Felix Hernandez pitch a perfect game last Wednesday on a trip to Seattle with my sweetie. Next highlight: 3 nights of the Dave Matthews Band at the Gorge Amphitheater in George, Washington over Labor Day. What a cute baby quilt! The highlight of this summer so far is the number of quilting projects I have finished including the family Xmas quilt and the birthday quilts done way ahead of time. Lovin' that baby quilt! Highlight of my summer was finally getting a JUKI! Summer highlight--the mornings the sun touches the leaves outside my studio window, and the mornings the trees are lost in the fog, and the mornings the rain adds new textures and changes the shades of green in ways light simply cannot. Yes. Mornings. I'm digging those colors! The highlight of the summer for me would be when we went camping at the White Mountains. It was simply amazing! The kids couldn't get enough of the outdoors. Love the colrs in your quilt. The highlight of my summer has been riding motorcycles in the mountains. A lot cooler there. I love your co-ordinating outfit!! Best Summer memories so far...summer camp fire, kids eating marshmallows toasted on sticks and my good friends singing Elvis medleys under the stars! Would love to have this new magazine! Summer highlights? 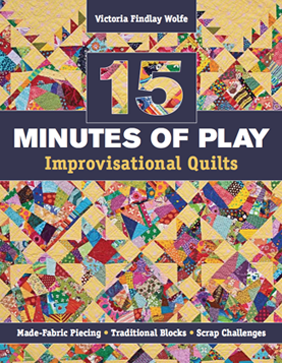 Quilting with friends, old and new, which often included lunch. Glad you enjoyed your trip to Canada! My summer highlight was having my son coming to visit for a week. What a great baby quilt and I need to make a baby quilt soon. I hope I win a copy of the magazine or will look for it. Thank you for the chance. LOVE the pink.